If you thought BBBO hung up our bird bags for the summer, you’d be wrong! As the summer temps heat up, we simmer down a bit at BBBO. We move from banding daily to banding more sporadically. Most of the birds are local, and we don’t want to keep catching them day after day, so we do some “spot checking” to see how the season is progressing. The bird numbers and species diversity are relatively low, but summer is anything but dull! 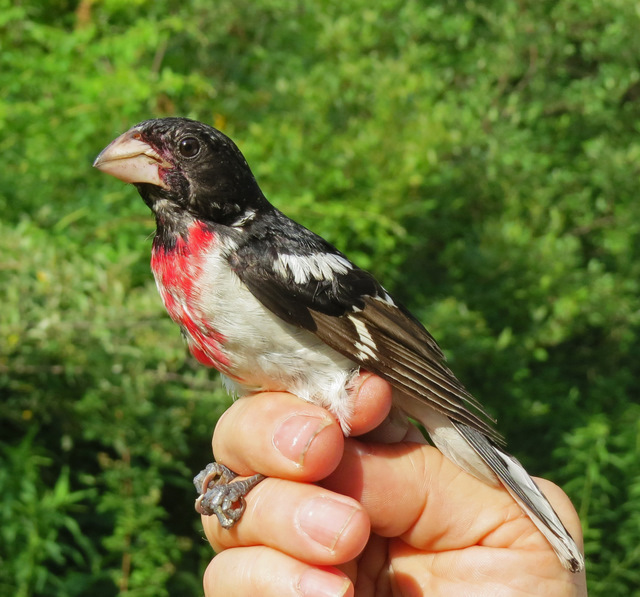 We were open just three days in June, but managed to pick up 35 birds of 21 species. 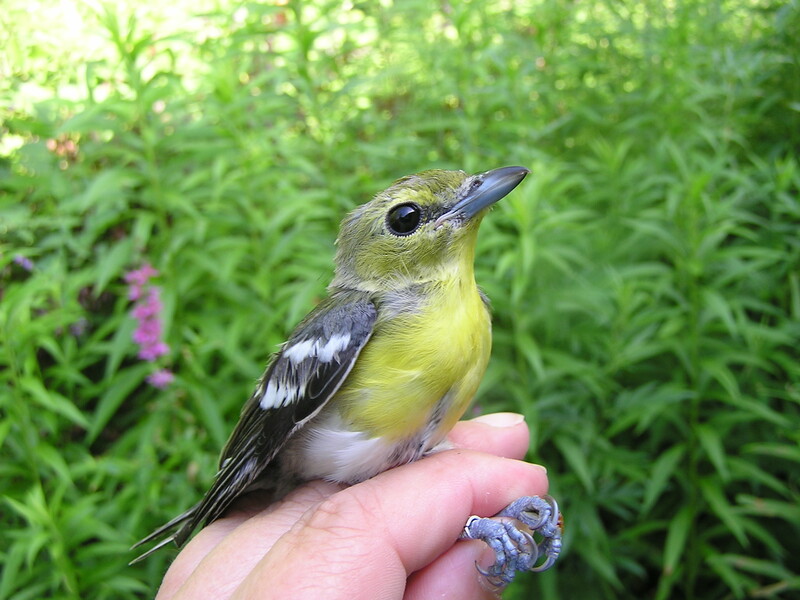 June 12 was characterized by late migrants – mostly young females – of several species including Ovenbird, Magnolia Warbler, Canada Warbler, Mourning Warbler, and Yellow-bellied Flycatcher. June 16th and 17th saw a more typical mix of Gray Catbirds and Yellow Warblers. Two days in early July saw only expected species, with one exception – a beautiful Morning Dove graced us on the 8th. Usually these birds escape the nets with ease, as their roly-poly large bodies keep them from getting tangled. Things ramped up a week later during our Teen Bander Training Camp. Camp was held this year from July 16-20, and we were open every day (although we didn’t open all the nets). Three students – two of them local young birders – spent mornings in the field and afternoons learning about aging, molt, ethics, and setting up a station. Most of the passerines moving through BBBO molt before before they migrate, but there are always a couple who go rogue and they migrate before they begin (or at least complete) their molt. I told our teen banders that I expected one of these “molt migrants” to show up during class, and we weren’t disappointed! We saw a very tattered Swainson’s Thrush on the 18th – the first of three to migrate through in July. Molt migration is common in waterfowl and also in birds that inhabit arid environments. 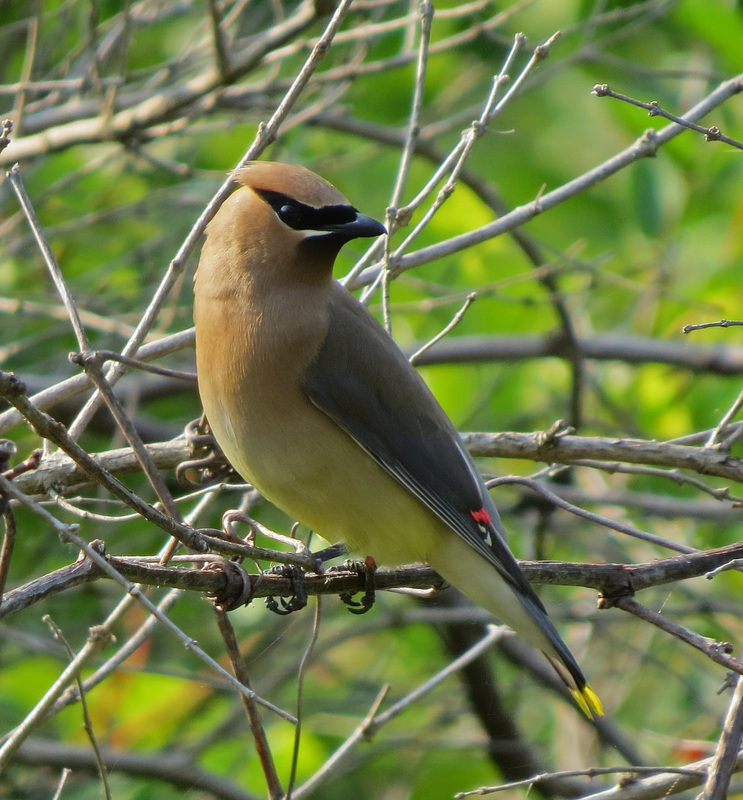 While our July Swainson’s almost always appear in some stage of molt, those that move through later in the fall will have completed their molt before they arrive at BBBO. 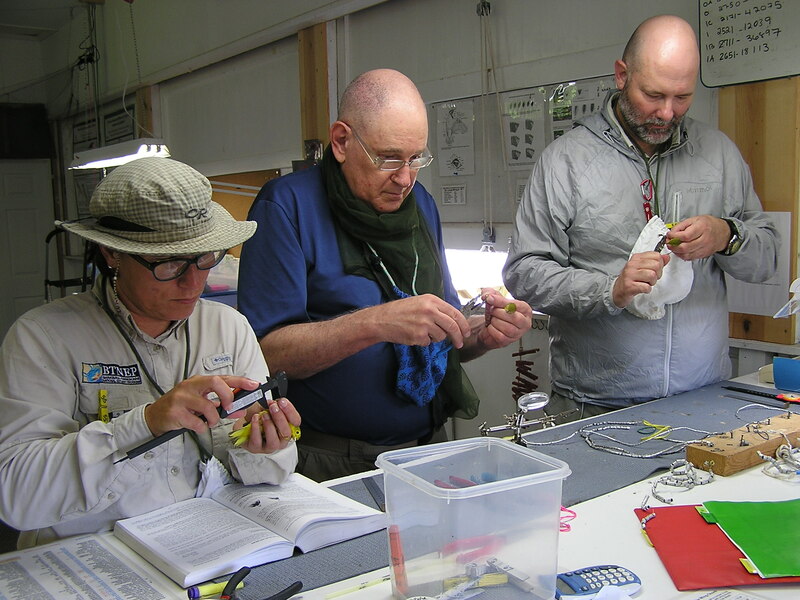 July 22-25 saw four adult banders visit BBBO as part of the Advanced Molt Workshop we offer every summer. Dawn and Rebecca were returning students from our fall 2017 class, and Vinnie and Sylvia came up from Ohio to get experience working with other trainers. We had a FANTASTIC time – and I think everyone learned something (including the instructor!). The rain tried to spoil our mornings, but we worked around it and banded in the afternoons if necessary. 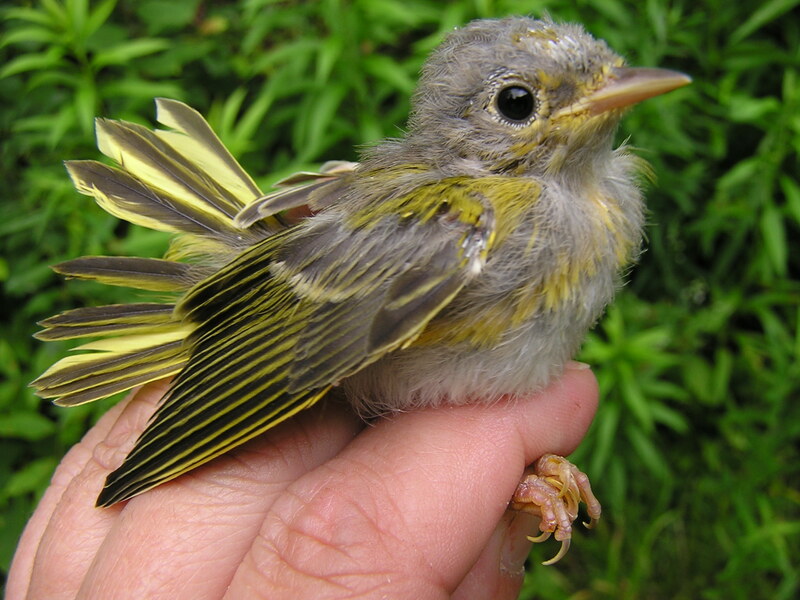 We were keep busy with Gray Catbirds, Cedar Waxwings, Yellow Warblers and Common Yellowthroats, but we were treated to a smattering of other species including our second molt migrant – a Tennessee Warbler. We rounded out the summer with a few additional days at the end of July, in order to pick up the tail end of the Yellow Warbler migration. 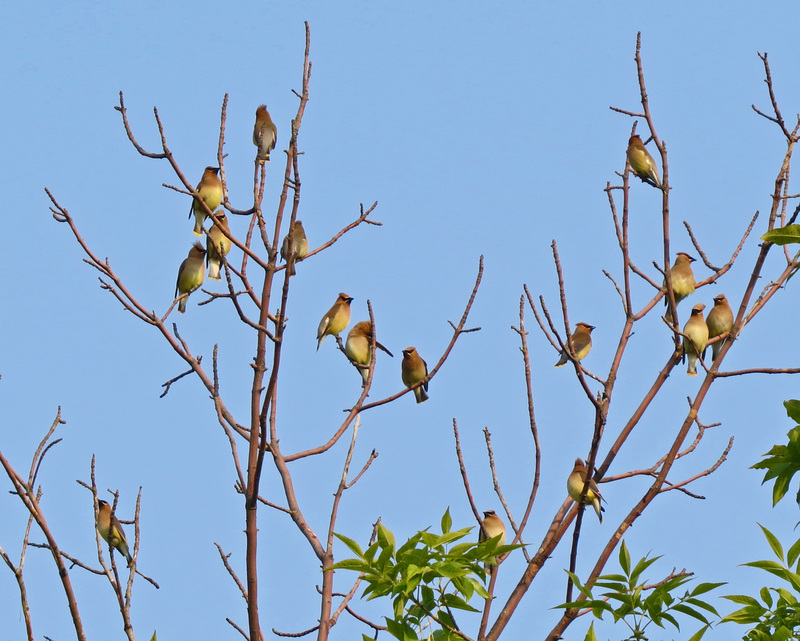 In addition to dozens of sunny yellow birds, we got two nice surprises – an early Winter Wren, and adorably awkward juvenile birds – an Eastern Phoebe and a Cedar Waxwing. 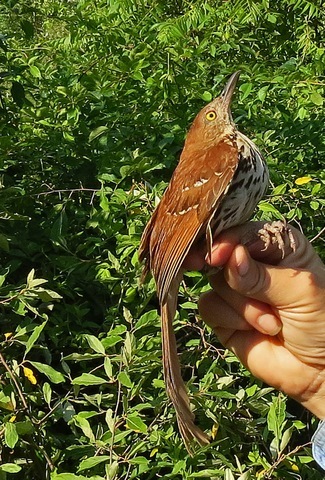 We ended the summer season with 446 birds of 37 species, and 99 recaps. BBBO focuses on migration, but that doesn’t mean we sit at home in air conditioned comfort during the summer months. 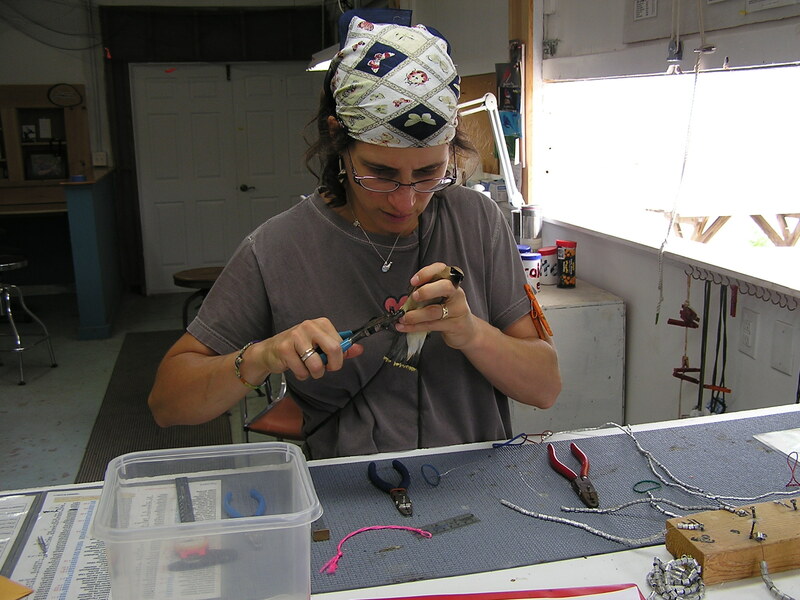 This summer we staffed MAPS stations at Kaiser-Manitou Beach and High Acres Nature Area, carried out bi-weekly banding at the main banding station, and taught both beginner and advanced students. Here are some summer highlights! One day while banding, a chance glance to the left of our main path revealed what looked like a nest. The first nest. Is it empty? 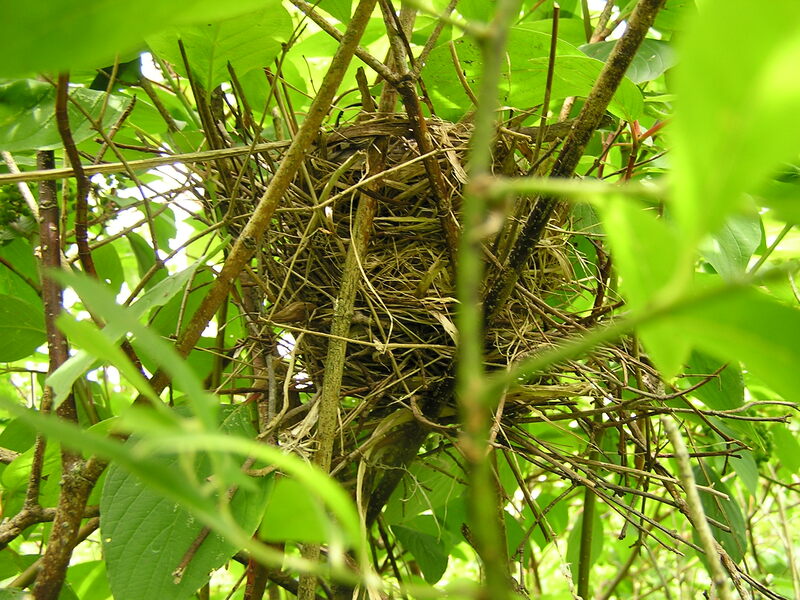 The nest was about 8 feet high and was pretty inaccessible (due to a water-filled ditch and lots of understory). 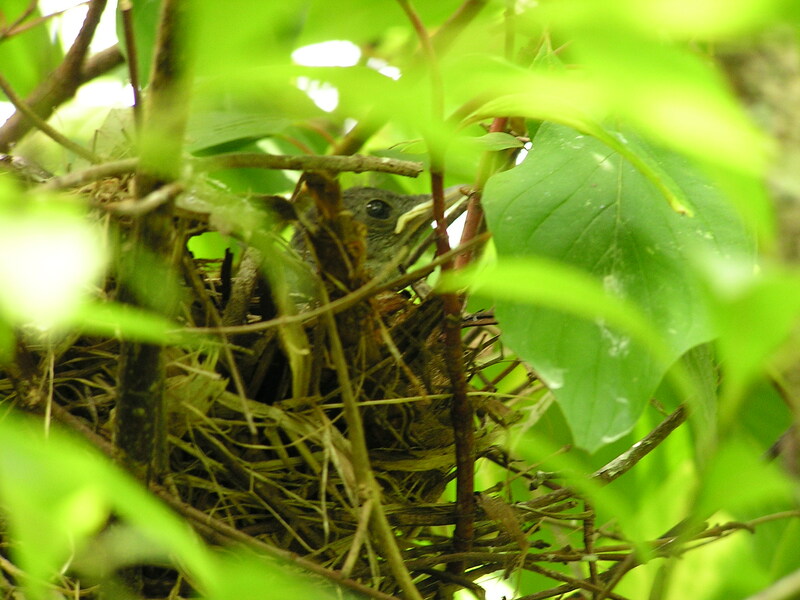 Since we had to walk by the nest several times each morning, we were able to keep a discreet eye on it. It appeared to be abandoned, as we never saw adults on or near the nest, nor did we ever hear or see birds flush away from it. However, one day, we saw this . . . The lighting isn’t great, but it appears to be a baby catbird! We never saw the bird after this day (that we know of), nor did we ever see any other young in the nest but we assume that it (or they) fledged successfully. While walking on a completely different path, we had a different experience. Every time we walked by a particular spot, we heard a rustle near the ground. It happened so often on a particular day that we stopped to take a quick look. 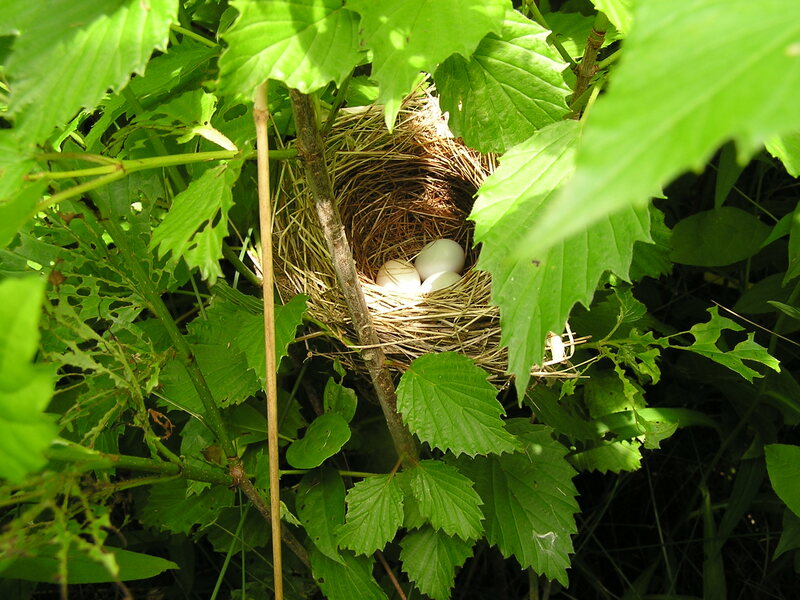 Although it was extremely well hidden, we found a beautiful nest with three white eggs. We decided it was an Indigo Bunting nest, and we took steps to protect it. We changed our route to completely avoid the area, and we permitted ourselves only one peek at the nest one week after it was initially found. 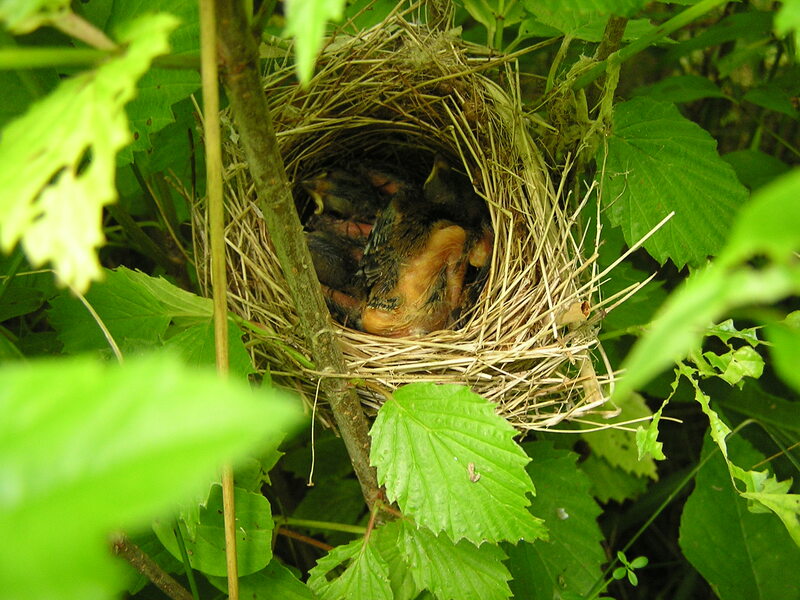 The eggs had hatched, and there were three nestlings cuddled together in the small cup. We weren’t entirely certain when they had hatched, and so we left them alone to mature and fledge without any further disturbance. 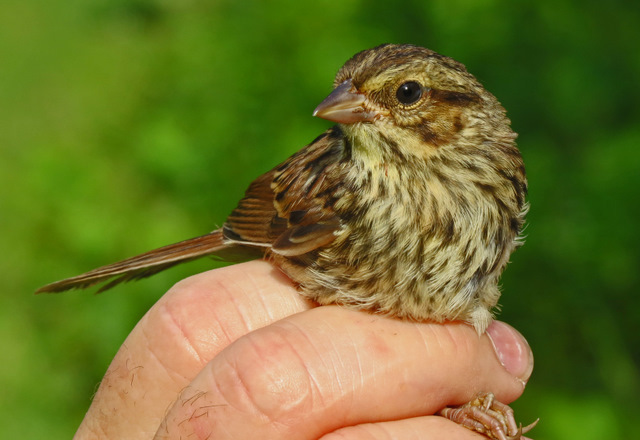 Interestingly, a couple of weeks later, we caught three juvenile Indigo Buntings in one of our field nets – just 20 feet from the nest location. Were they our three babies? We’ll never know, but we like to think so! We banded them and sent them all safely on their way. We band juveniles of other species as well, including the . . . um . . . Gray Warbler pictured below. He (or she) is actually a Yellow Warbler, just molting out of its juvenile plumage and into its formative plumage. We banded an astonishing number of young Blue-gray Gnatcatchers and Nashville Warblers, and one day we were swamped with young House Wrens. Eventually, the young birds prepare to migrate. 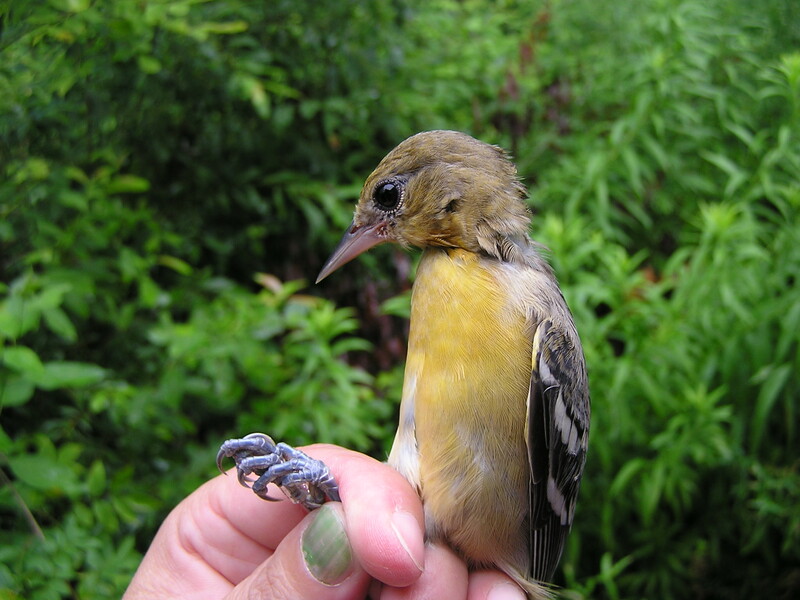 The young Baltimore Orioles flocked up near the beginning of August and filled the field nets. 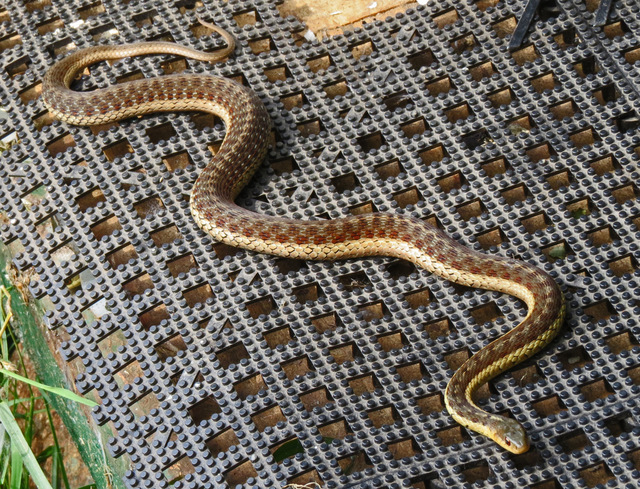 Between August 5 and August 9, we banded 16 of them. That actually sets a record for fall! (Even though August is sort of like summer, we record the numbers on our fall tally sheets). The day of the Orioles . . .
Then there were the unexpected birds. The Yellow-throated Vireo . . .
And the Blackpoll Warbler – in JULY! What was he thinking??? Wait . . . what??? In JULY??? Actually, we suspect he had a failed nest and then just gave up on the breeding season. Instead of starting over, he decided to wander around for a bit. Josee from HBBO/KBO, currently a grad student at Oregon State University at Corvallis. And we had folks from Louisiana and California attend an advanced bander workshop. We worked hard to understand molt, and I think we all learned something! Delaina, Neil, and Jed from the Advanced Bander Workshop. 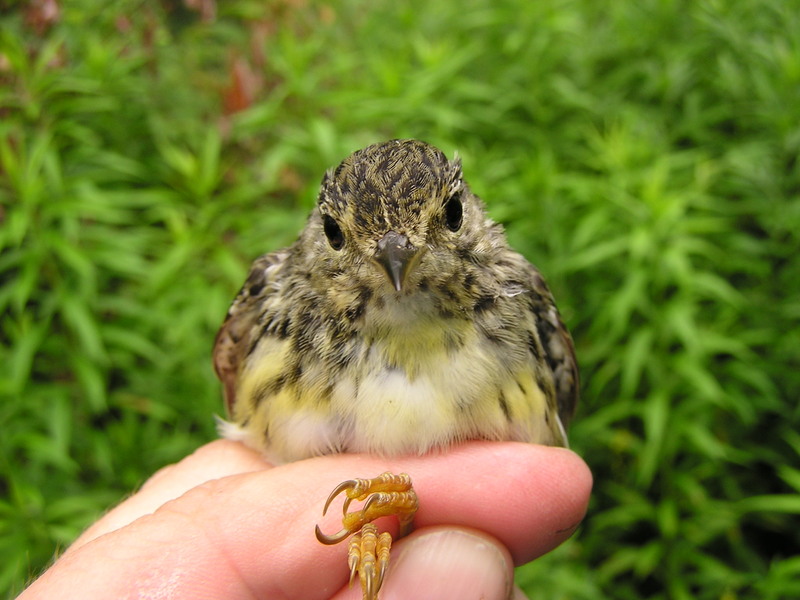 The workshop was scheduled during “Yellow Warbler Week,” and it lived up to its name. All three banders in the photo above have one in hand! The doldrums of August are beginning, but so is the slow steady trickle of migration. It won’t be long before we are seeing White-throated Sparrows and a pile of thrushes. We hope you all find time to visit us in the coming months! 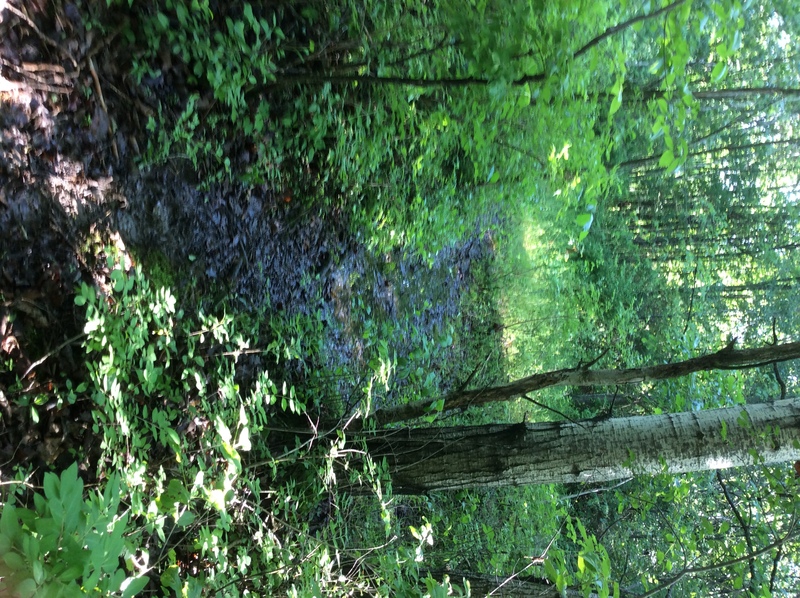 High Acres Nature Area – July 15, 2015. We had to dodge the rain and later the wind to complete the MAPS session last Wednesday. To add to this our numbers of birds were low. 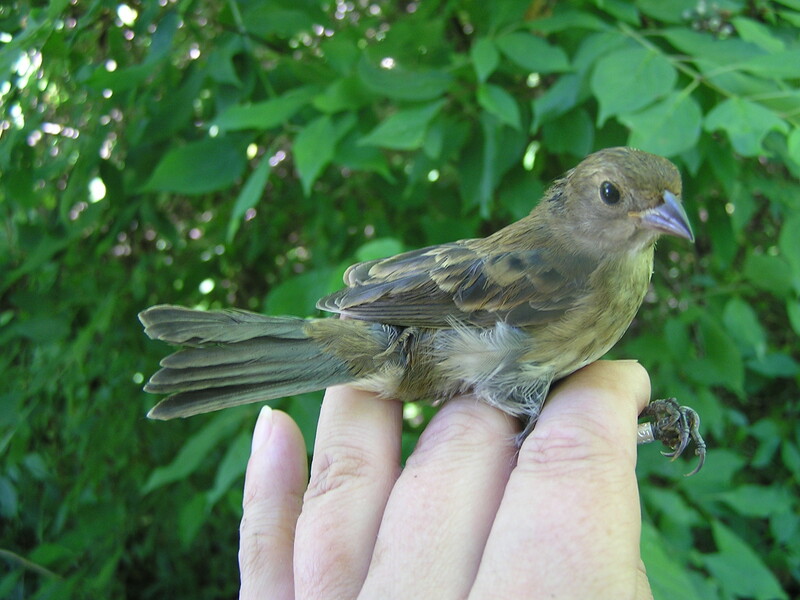 We banded only 11 new birds of 7 species and processed only 9 recaptures. Nevertheless, this turned out to be a very productive day. We had a staff of five well established banders and this gave us time to review some of the fine points of MAPS banding as we processed the birds. We also were visited by Dr. Christy Tyler’s summer research students. The slow day made it possible to spend more time talking with them about the importance of avian conservation and specifically about the contribution of MAPS studies to conservation. 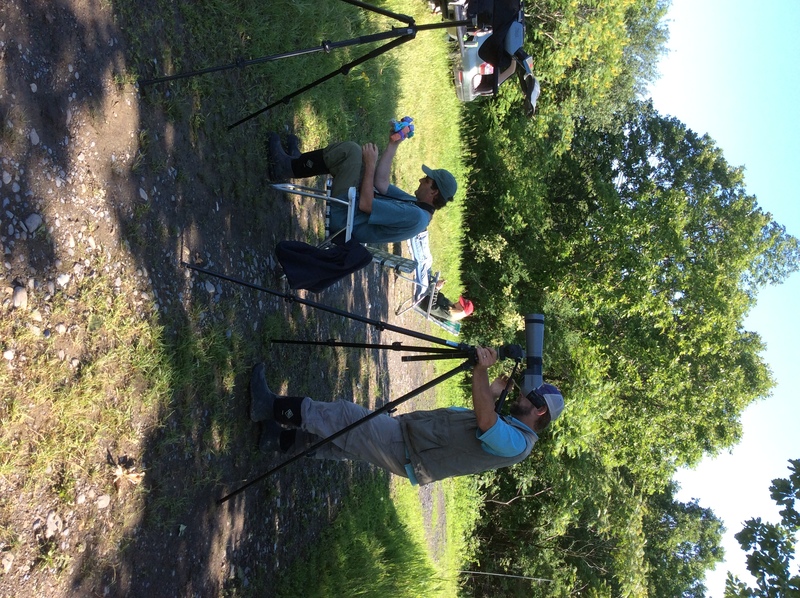 Lastly, a student from the Braddock Bay Bird Observatory bander training program was present, and we used the time to help him work on his skills. While our numbers were low, the day was highly productive! Special thanks go to David Mathiason, Andrea Patterson, Aggie Windig, and Barb French for their help.